Whatever happened to the “Land of Opportunity“? The average American is over $45,000 in debt. In the past 3 or 4 years, housing prices have dropped 35%. There goes the retirement nest egg. Or sending the kids to college. When a friend of mine tells me: “Well, I am only $10,000 in debt. I’m doing better than most Americans…” I could just shake him. Here’s the other side of the story: there are over 8.6 million households in the U.S. with a total net worth (minus principal residence) of $1 million or more. That’s a lot of millionaires. So which group do you want to be in? I know which one I am in. I know what it took to get there and stay there. And I want you to be in that group, too. So why aren’t you a millionaire? Since you are here, I know you want to be. After 25+ years as a Clinical Hypnotherapist, I think I have an idea why people, just like you, haven’t earned the income they desire. 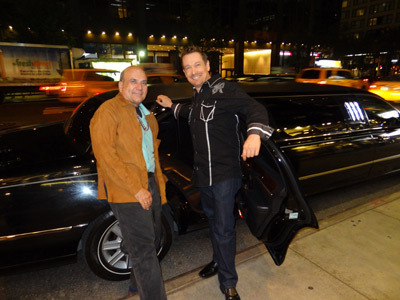 “Being someone who is extremely familiar with the power of hypnosis, I can say without a shadow of a doubt that Clinical Hypnotherapist Steve G. Jones is among the best in the world. 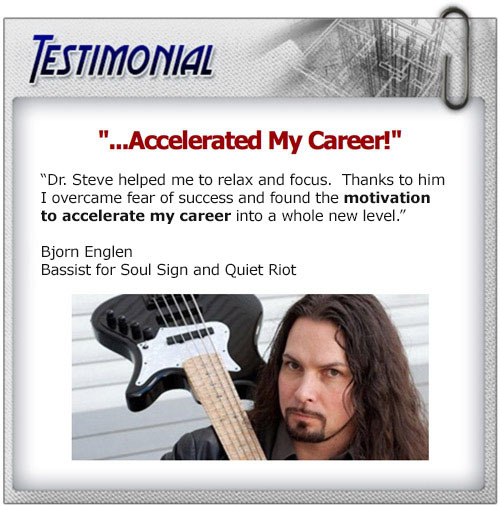 “Aside from his long list of achievements and educational accomplishments, Steve’s dedication to perfecting his craft through hard work is clearly demonstrated through the fact that he has created the largest set of hypnosis recordings in the world. Believe me when I tell you, they work. 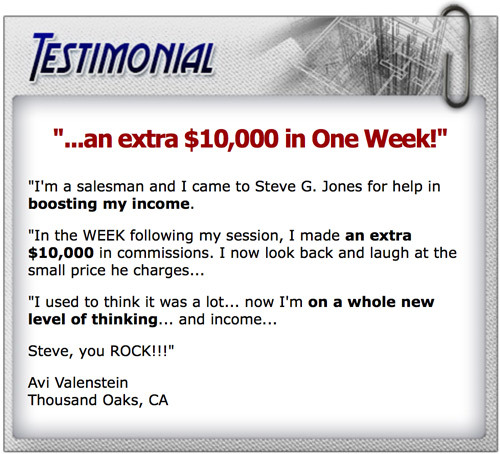 “To anyone interested in improving their life in any way, I would highly recommend anything that Steve G. Jones has created. Whether you are looking to lose weight, stop smoking, unlock your potential or just improve your overall quality of life, Steve’s empowering resources can help you. So why do good people fail to achieve Financial Freedom? Or even get out of debt? There are five barriers that successful people overcome that unsuccessful ones don’t. And it wasn’t that they couldn’t. They just didn’t. There are five barriers that successful clients overcame that unsuccessful ones didn’t. And it wasn’t that they couldn’t. They just didn’t. For whatever reason, they weren’t willing to put in a little time and almost no effort to build the life they wanted… free from bouncing checks and melodramatic relationships. And all because they ran into one or more of these five walls of failure. So I put together a special program specifically designed to explode you through these five walls and propel you to your Destiny or Abundance, not one of failure and mediocrity, but one of wealth and fulfillment. I call it: Millionaire Mastery Blueprint! In just 5 short weeks, is going to turn your financial picture around and get you focused on achieving the life of your dreams. Confidence all begins in the mind. Everything you are, everything you want to be, and everything you will be has to do with the amount of confidence you have. If you think about it, there isn’t anything you have or are that wasn’t made possible through first believing in yourself that you could get it, be it, have it, or do it. So, when we work on our confidence we work on that part of ourselves which is creating our lives. 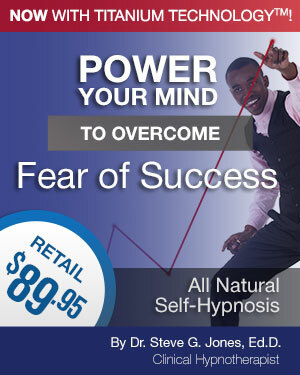 Once you change your inner world through hypnosis you automatically, without even trying, change your outer world. Your subconscious mind always feeds your conscious mind with ideas. These ideas are what power your life when you have positive, productive, confident life. When your ideas are hindered by your lack of confidence, you find yourself circling rather than moving forward. After one week of listening to this session, you will find your confidence soaring. Now you are ready for week two…. At some point in our lives, we all need a little motivation. Whether your goal is to start a new business, run a marathon, or to just clean your home, you need to be motivated to see the job through from start to finish. For some people it may be easy to get motivated for a short-term goal, but what is going to take to keep you motivated for a goal that could take years to accomplish? Imagine a goal that you have been trying to reach. Perhaps you have been working on something for a couple of days, or maybe you have been working toward a certain goal for years. Imagine the sense of accomplishment you will feel when you reach that goal. You deserve to be motivated and reach your goals! Now you are ready for week three…. It is simply a matter of first realizing this truth and second making it a reality in your own life. Hypnosis and using the Law of Attraction to get what you want is the key to accomplishing the goal of creating more abundance by drawing from your own resources and then adding upon that foundation. Abundance is defined as: A quantity that is more than enough; plenty. According to this definition, it is realistic to then link abundance to contentment. And contentment can be then be connected to happiness. This is a very subjective state of being. It makes sense then that hypnosis which works with the thoughts and feelings present in an individual can teach you how to be happy, content and have an abundance of that which matters most to you. Abundance is something you create for yourself, using the Law of Attraction to get what you want. It may take greater motivation at work, a stronger commitment to family, or the willpower to give up that which gets in the way of an abundant life. Whatever the obstacle, hypnosis can remove the barriers. 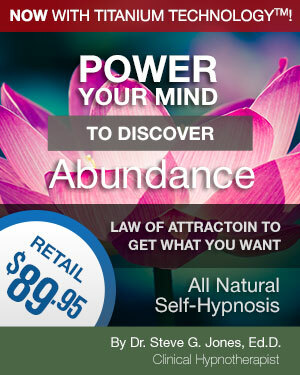 You can create abundance though hypnosis and the Law of Attraction and start realizing your goals. Now you are ready for week four…. Do you ever find yourself reaching for goal, but for some reason or another you aren’t able to accomplish your goal? You may have a Fear of Success. You have to be willing and wanting success in your life in order to allow it in. Perhaps you do things (without realizing it) that prevent yourself from reaching success. All of us want to be successful at something whether it is a job, sport, family, or relationship. Being successful takes work and it takes time. The most important part in achieving your goals s figuring out what they are in the first place. You cannot work towards a goal without first defining what that goal is. I encourage you to figure out what you want to be successful at. Think about what it would take to reach this goal. After you have defined your goal and developed a plan, then you can start working towards it. Realize that success takes time to achieve, so be patient and allow it into your life! If there is one thing I have learned over the years, it’s not to be afraid of taking a chance. Failure is the worst thing that could happen, but the best thing that could happen would be success. For me, the possibility for success far outweighs the possibility of failure. I’d like for you to take a moment out of your day and think about something for a minute. Think of something that you have dreamed of doing, but something has been holding you back. I want you to put down everything that you are doing right now and come up with a plan, that’s right! I want to motivate you to take a chance on something you feel passionate about. Perhaps you want to change your career or perhaps you want to try something new. Whatever it is that you want to do -Do it! Take the first step right now!! Chances are that taking this risk will vastly improve your life. You should strive to be the best person you can be. Once you have a goal in place, be sure to stay on track. Keep a positive attitude at all times. And if you hit a roadblock along the way, that’s okay because you will be able to figure a way around your obstacles. Realize that if you fail, you can re-evaluate your actions, make changes, and try again. The only way to learn is by making mistakes every now and then. Titanium Technology™ was designed for superior sound technology and with highly customized engineering to give you the most effective and relaxing hypnotherapy session possible. Incorporating specialized techniques to enhance vocal smoothness and clarity, Titanium Technology™delivers the ultimate PC/MP3 player audio experience. It restores detail and clarity back to compressed music files like MP3s! Face it, if you are going to change your life, you want the best, most impactful tools and how effective is a poorly made audio hypnosis session? Hint: not very. Binaural tones or binaural beats are relaxing sounds are mixed into the Titanium Edition recordings allowing for a deeper relaxation and a more effective session. There are several different licensed music sound tracks containing binaural tones (beats) used on your audio recordings. So, as you listen to each session over the next five weeks, there will be variety in the background music you hear. These tracks were custom-made for me in a specialized, state-of-the-art recording studio in southern Florida. My hand-picked sound engineer worked together with a doctor to create the best possible binaural sound experience. These five sessions contain the same binaural technology used by the Monroe Institute and other Mind/Body researchers. Binaural beats (or tones) were discovered in 1839 by the German scientist, H. W. Dove. He found that humans possess the ability to detect the subtle phase shift of sounds arriving in one ear slightly before arriving in the other. The sensation of binaural beats occurs when two coherent sounds of nearly similar phase relationships or frequencies are heard by the listener. The brain detects phase or frequency differences between the sounds. the brain then combines the two signals producing an internal representation of a third sound called the binaural beat. Hemisphere synchronization (from binaural beats) has been shown to positively impact a whole variety of emotional, spiritual and mental states. The Binaural Beats affect your brainwaves. And. depending on the Binaural Beat, put you gently into trance states of high suggestibility. Imagine looking into the future and see yourself already having achieved your desired success. Future pacing is an advanced NLP (Neuro-Linguistic Programming) sub-modality of “embedding” the changes you want into your future – to give you the powerful experience of dealing positively with a difficult situation before you get into that same situation again. This is based on visualization: your mind cannot tell the difference between a scenario which is real and one which you clearly visualize. Once having visualized success, when you are again in the real-life situation, the previous hypnotic experience will give you the confidence you need to smoothly sail through the actual situation. Once you “see” it, your subconscious mind works to bring it into reality. So you are literally “drawn” into your success. An induction is the part of the hypnotherapy session in which you relax into a deep hypnotic state. The deepening is the “counting down” part in which you relax even more. We create a relaxing story (such as a walk on the beach) as the induction and deepening. 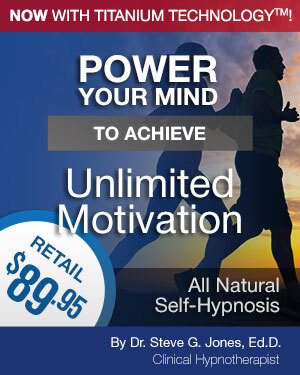 these are the foundation of an effective hypnosis session. Without them, your session would be ineffective. 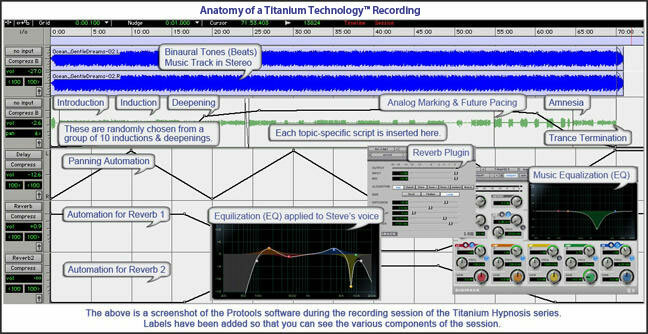 On my Titanium Edition recordings, I use a variety of different inductions and deepenings. So, for example, as you move through the 5 week process with these proven hypnotherapy sessions, you will experience variety in the inductions and deepenings, rather than the same induction and deepening. This gives your subconscious mind more powerful stimuli to propel you toward your financial goals. Additionally, I varied the relaxing background music is used in the sessions. The brilliant NLP technique of Analog Marking takes a command for positive change and embeds it into the session. Analog (or analogue) refers to anything that has shades of meaning, a spectrum of options, or which changes gradually and smoothly (like the yellows, oranges and reds that develop as the sun sets, for example). Analog marking adds emphasis to a word or phrase. On my recordings I do this by saying a certain phrase within each recording with the commands spoken slightly louder than the other words. The marked out words give an additional message. Your conscious mind will not notice the marking, but your subconscious mind will receive the underlying message. Analog marking is a form of embedded (hidden) command, which is very effective at changing poverty consciousness to wealth consciousness. These recordings ordered separately would be $449.75, and well worth your time and investment. But you are here and ready to take action on your financial future, and I am going to reward you for that. When you purchase TheMillionaire Mastery Blueprint, you will have a full 60 days to experience the program and ensure your satisfaction. 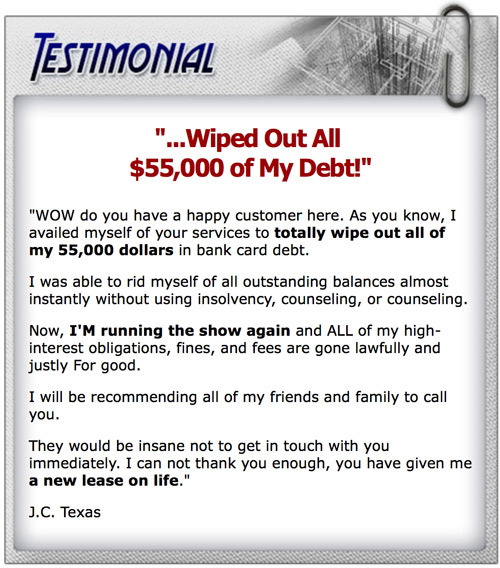 But you are fully covered by my iron clad, no quibbles satisfaction guaranteed policy, which means if you are not totally delighted with TheMillionaire Mastery Blueprint, you will get a prompt and courteous refund. We want to get this in the hands of as many people as possible. Our goal is to reach one million people. Keeping the price low, while still being able to offer you the very best life-changing hypnotic sessions, is the way we plan to achieve it. 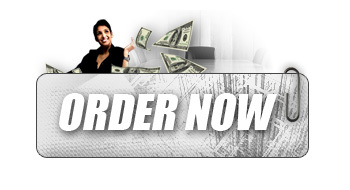 So by taking action today, you will save a massive $402.75! You read that right. 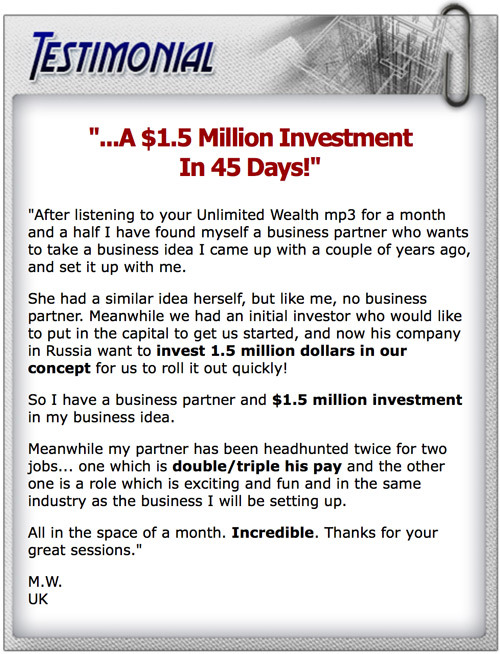 If you bought the sessions in The Millionaire Mastery Blueprint singly, they would cost $400, but today when you commit to your revolutionary 5 week wealth program, the whole package will cost you almost half the price of buying one audio hypnotic session. Today Only: $47. 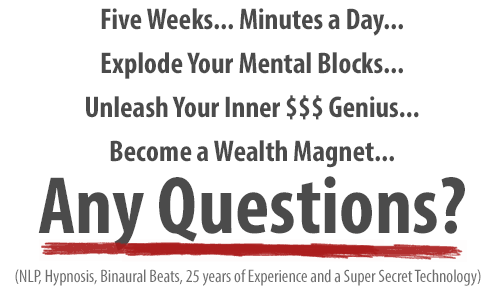 Ready to unlock the wealth mindset within you… without years of struggle? Want to taste true wealth… without another let down? Want to remove the largest obstacles blocking your path to success… without straining a single muscle? The Millionaire Mastery Blueprint does all this and more! Join us today! P.S. Imagine five short weeks from now, your financial goals are becoming reality as the blocks that prevent your success gently melt away. Your Millionaire Genius blossoms and opportunities that would have scared you to death before are handled quickly and easily. Don’t delay. Take the most important step of your life today! P.S.S. 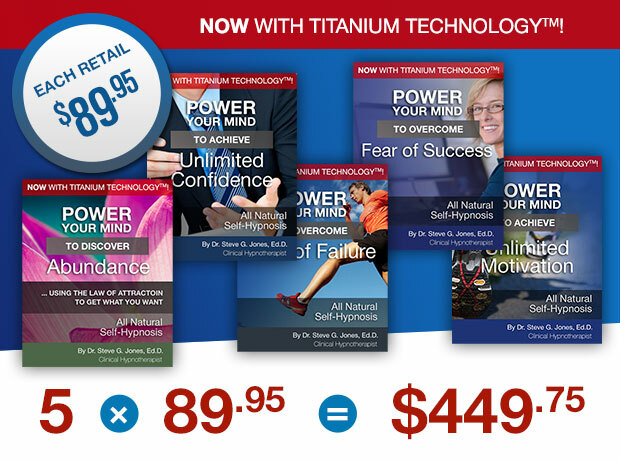 When you claim your copy of the Millionaire Mastery Blueprint, you will be taken to a download page where you can download your audio Titanium Technology™ Hypnosis sessions in minutes. Each Titanium recording is approximately 70 minutes in length. You will want to listen to the self-hypnosis session at night before you go to bed for 21 nights in a row. Each Titanium recording has binaural tones, which are low-frequency pulsations that produce relaxation to fully enhance your hypnosis experience. The Titanium Series has superior sound technology and highly effective engineering to give you the most relaxing hypnotherapy session on the market. Each Titanium recording consists of one out of ten randomly chosen inductions and deepenings that are designed to relax you into a state of hypnosis. Next is the script. The script consists of 30 minutes of powerful affirmations to reprogram your subconscious mind to make changes in your life. Steve also includes NLP techniques in his Titanium self-hypnosis recordings. These NLP techniques include analog marking and future pacing which will further enhance your hypnosis session. At the end of the session, Steve suggests that you fall into a deep sleep and this is the reason why the recording should be listened to before going to sleep. This allows the listener to look into the future and see him/herself already having achieved the desired change. Future pacing is a technique of “embedding” change into the future – to give the person an experience of dealing positively with a situation before they get into the same situation again. This is based on visualization: the mind cannot tell the difference between a scenario which is real and one which has been clearly visualized. The idea is that, having visualized success, when they are again in the real-life situation, the previous hypnotic experience will give them the confidence they need to smoothly sail through the actual situation. An induction is the part of the hypnotherapy session in which the client is relaxed into a hypnotic state. The deepening is the “counting down” part in which you relax even more. It is always good to create a relaxing story (such as a walk on the beach) as the induction and deepening. On my Titanium Edition recordings, I use a variety of different inductions and deepenings. So, for example, if you buy a number of my hypnotherapy recordings, you will have some variety in the inductions and deepenings, rather than the same induction and deepening one on each recording. Additionally, a variety of music is used on the recordings. The sound engineer worked together with a doctor to create the best possible binaural sound experience. My hypnotherapy CDs and MP3s contain the same binaural technology used by the Monroe Institute and other researchers for many years. Binaural beats (or tones) were discovered in 1839 by the German scientist, H. W. Dove. Humans possess the ability to detect the subtle phase shift of sounds arriving in one ear slightly before arriving in the other. This phase difference gives us directional information and allows us to determine the actual location and origin of a sound. The sensation of binaural beats occurs when two coherent sounds of nearly similar phase relationships or frequencies are heard by the listener. The brain detects phase or frequency differences between the sounds. the brain then combines the two signals producing an internal representation of a third sound called the binaural beat. The binaural beat resulting in the brain is the phase or frequency difference between the two sounds.FAQ: What if I have a hearing loss? A slight hearing loss in one or both ears does not reduce the effectiveness of binaural beats. It is not necessary to actually hear the binaural beats in order to relax the brain to the desired state; therefore, audible beats are not used on my recordings.FAQ: How should I play the recordings? Any good CD player will work well. The MP3 audio files are just as effective as the CDs and will run on any computer or MP3 ready player such as an iPod.FAQ: Do I need to use headphones? Headphones are not required, but they do eliminate background noise and allow for a more focused session. If used, those that completely cover the ears are recommended. A well-fitting pair of ear buds will work fine if there is not a lot of background noise. Increased time of each recording – now a full 1 hour, with 30 minutes of scripts! I use the NLP technique of Analog Marking (taking a command for positive change and embedding it into the recording). Analog (or analogue) refers to anything that has shades of meaning, a spectrum of options, or which changes gradually and smoothly (like the changes in a row of mountains, for example). Analog marking means adding emphasis to a word or phrase. On my recordings I do this by saying a certain phrase within each recording with the commands spoken slightly louder than the other words. The marked out words give an additional message.Your conscious mind will not notice the marking, but your subconscious mind will receive the message. Analog marking is a form of embedded (hidden) command. All of my Titanium Edition hypnotherapy CD and MP3 recordings have stereo imaging. This allows for a more encompassing and realistic experience when used with headphones. Stereo imaging is the audio term used for the aspect of sound recording and reproduction concerning spatial locations of the performers, both laterally and in depth. My well-made and properly produced stereo hypnotherapy recordings provide good imaging all around the listener. This adds noticeably to the pleasure of listening to my recordings. I am so certain that you will enjoy my recordings and achieve your goals that I am offering a full 60-day money back guarantee. 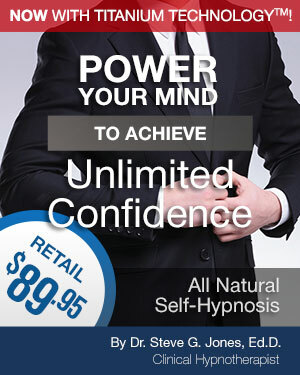 There is absolutely no risk in buying my hypnotherapy recordings. Try them and see how you like them. My 60 day money back guarantee insures that you have plenty of time to feel the powerful effects of my recordings…or you will receive a full refund. Two distinct spaces have been created through added reverberation to introduce a feeling of traveling deeper into the subconscious and back.